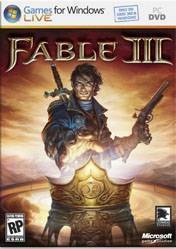 Fable III is set 50 years after the events of Fable II. The game is set on the fictional continent of Albion, which is entering the age of industry. The King/Queen, the hero/player character of Fable II, has died and left the Kingdom of Albion to their son, Logan (voiced by Michael Fassbender), the player\'s older brother. Some NPCs allude to how Logan has \"changed\" in the four years of his rule, becoming excessively tyrannical. The player begins the game investigating rumours that Logan had a citizen of Albion executed, causing a group of citizens to protest. After the player character intervenes, Logan presents the player with the first of the game\'s numerous moral choices. The player is tasked with deciding whether the group of protesters are executed, or whether the player\'s love-interest is executed instead. Following the decision, the player escapes Logan\'s castle along with their mentor, Sir Walter Beck (Bernard Hill) and their butler, Jasper (John Cleese). There are no comments yet about Fable 3 . You can be the first one!